CCI provides integrated Palm Oil Mills ranging in capacity from 2 – 40 FFB Tons per Hour. Our offering is based on our exclusive technology collaboration with Teknoemas Sdn. Bhd. in Malaysia. We have the distinction of having set up one of the largest Palm Oil Mills in India for Godrej Agrovet for a capacity of 20 FFB TPH. Palm Oil Fruit, under favorable conditions of climate, provides the highest yield of all oil bearing plants. 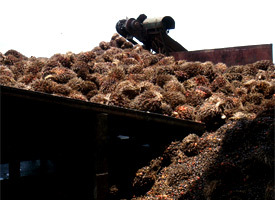 In order to prevent bruising the Palm Fruit, it is normal to process fresh fruit bunches (FFB) rather than stripped fruit. This has the added benefit of minimizing the free fatty acid (FFA) set-up and allows the stripping to be mechanized. The first step in our process cooks the fruit for the purposes of Sterilization, which allows for complete mechanical stripping while deactivating the lipase enzyme. The fresh fruit bunches (FFB) are filled in open-topped perforated steel cages mounted on a wheeled chassis which is pushed into the Sterilizers on rails for cooking at 3 bar steam pressure. In the next step the FFB’s are stripped in order to separate the sterilized fruits from the sterilized bunch stalks. The Stripper is a Rotary Drum Stripper in which the sterilized bunches are continuously fed. The surface of this drum is made up of tee-bars running parallel to the axis of the cylinder and spaced far enough to permit the escape of fruit while simultaneously preventing the stalks from exiting. From the Sterilizer the sterilized fruit is sent to a Digester. The pericarp that is loosened from the nuts is then prepared for pressing. The Digester essentially consists of a live steam heated vessel with stirring arms. The extraction of the Crude Oil from the digested palm fruit now occurs by means of Pressing in Continuous Double Screw Presses. The Crude Oil thus extracted contains varying amounts of water together with impurities like sand, vegetable matter etc. which is in the form of insoluble solids, some of which is dissolved in the water. These impurities are now removed in the different steps within the Clarification section. This involves separating the diluted crude oil in a continuous settling tank into a relatively clean and dry top oil fraction and and lower sludge fraction. Both these fractions are now centrifuged separately. The sludge water is sent to a Decanter to separate the clear water solids and oil. The oil layer is pressed by a high speed nozzle centrifuge to remove all dirt and fibre remaining. In order to prevent any FFA build-up, due to the presence on any dissolved water, the oil must be dried in high vacuum driers before storage. Aside from the oil, the digested fruit from the above process is now in the form of a cake made up of nuts and fibre. This cake is now broken by sending it in a trough-type conveyor with a rotating shaft fitted with paddles. The fibre is separated from the nuts by air separators and is sent to be used as fuel for the Boiler to generate the process steam. The nuts are now prepared for drying and subsequent cracking. The kernels separated from the shell around the nuts are now cleaned and dried prior to bagging. Complete lines are also available from CCI for pressing the kernels into Palm Kernel Oil (PKO). Total Kernel Loss in Fibre / Shell 0.3% to FFB max. Oil in Press Cake after Second Press 10% max. Broken Kernels after Winnowing 20% max.